James First Affair draws off by nearly three-lengths under jockey Cody Jensen to set the fastest qualifying time. BOISIE, ID�JULY 23, 2014�A pair of IVORY JAMES 2-year-olds dominated five trials Wednesday evening at Les Bois Park for the John Deere Les Bois Juvenile. Each colt his won his trial by more than two lengths to take the top two qualifying spots. The 10 fastest qualifiers, from the 49 AQHA Challenge enrolled 2-year-olds who participated in the trials, will return on Saturday, August 9 and vie for the winner's share of a $22,500-added purse going 350 yards. Also at stake is a starting spot in the $150,000-Guaranteed John Deere Juvenile Challenge Championship (G2) to be contested on Bank of America Challenge Championship Night October 18th at Prairie Meadows. Trainer Mark Hanson and champion jockey Cody Jensen teamed to qualify the two IVORY JAMES colts. James First Affair drew off handily in the second trial by 2� lengths to post the fastest time of :17.546 seconds, a 94 speed index. The brown colt, owned by Robin Dunn, Larry Chapple and RTM Stables, LLC picked up his second win in three starts this season. Tom Bradbury and Kim Kessinger bred James First Affair in Oklahoma from the First Down Dash mare Fancys First Affair. 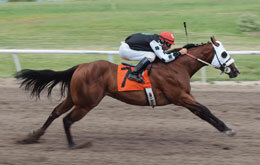 The $45,000 Los Alamitos Equine Mixed Sale graduate broke his maiden at Los Alamitos in April before shipping to Boise. He was eighth, following an awful break, in his first start at Les Bois in June. Blaine Bateman, the bay gelding came into the race off a third place effort in the Bitterroot Futurity on June 27. Also out of a First Down Dash mare, Christie Jo Dash, Steinway Ivory has won three of five starts and earned $23,338 this season. He was also a Los Alamitos Equine Mixed Sale graduate at $13,500. For the complete list of John Deere Les Bois Park Juvenile qualifiers, times, sires, dams, owners, breeders, trainers and jockeys CLICK HERE.